And before I say anything at all, I need to say that the London Book Fair is incredible. I’ve never been before. I may never get to go again. 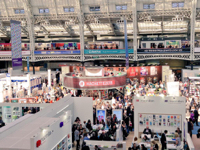 But walking into Olympia yesterday, clutching my pass in my hot little hand and walking in to this monumental hive of book activity as though I had a right to be there… I can’t be cool about that. Maybe one day I’ll be able to cultivate an aura of writerly mystique and float through the fair with an otherworldly expression, or even an air of slight weariness at all the bustle. But yesterday, I walked in grinning. I was part of a panel discussing the promotion of debut authors, chaired by Anna James of The Bookseller and brought together by Rebecca Gray, Senior Publicity Manager at W&N. Marissa Hussey, Digital Marketing Director at Orion, and Sheila O’Reilly, owner of Dulwich Books, completed the panel. After a brief discussion about debuts we felt had been particularly well promoted recently (I chose Kate Hamer’s The Girl in the Red Coat, the marketing for which included members of the team wearing red coats handing out samples at major train stations, and later discussed James Hannah’s A-Z of You and Me, another stunning example of what a unified publicity team can achieve), we moved on to how promotion has changed in recent years. It was fascinating to listen to Rebecca, Marissa and Sheila from the industry side. Sheila spoke about author visits; book signings, she said, are really only relevant now for celebrity autobiographies, or for authors who are already household names. Events need a hook, a reason for the audience to turn out on a weekday evening. Rebecca mentioned a recent trip to Cornwall with John Ironmonger, whose recent novel Not Forgetting the Whale is set there. The presence of the author prompted excellent sales in the bookshops. The conversation didn’t get as far as cake, sadly, but I did wonder whether this excellent one, baked in honour of John’s Cornish tour, helped to pull in the punters. Connections with bookshops are clearly very important; drawing bookshops in was a significant part of the award-winning marketing strategy for Jessie Burton’s The Miniaturist (Rebecca) and Elizabeth Healey’s personal visits to bookshops, followed up with goody bags from Penguin, meant that booksellers felt invested in the success of Elizabeth is Missing (Sheila). Discussion turned to Twitter and social media in general. The industry professionals in the panel agreed that Twitter is where the book buzz starts. Rebecca paid tribute to the growing community of book bloggers, who read and review and have a genuine influence over the fates of debuts. Sheila talked about Dulwich Book’s many followers (almost 8,000); a great audience for new book recommendations. Marissa said that a online presence is important for debut authors; she suggested that authors should try out all the social media platforms to find one where they felt comfortable. She also encouraged writers to make use of the many, many tools that are available on the Internet – explore Search Engine Optimisation, for example, and ensure your online activity includes tags that will attract the people who might be searching for a book like yours. I was asked about my own use of Twitter, and it was lovely to have a chance to pay tribute to the support and friendship I have found since I joined almost two years ago. I came to Twitter reluctantly, but quickly found, not a means of promotion, but a way of communicating with other people who are passionate about books. Now, it’s one of my chief means of retaining my sanity in a life that’s either solitary (writing) or filled with the needs of my four children. I tweet about what I’m reading and love getting recommendations from others; I’ve loved being part of the Baileys Prize shadow jury; I feel part of a community and I’m honoured to share in the triumphs (and the frustrations too) of the people I’ve come to know. For me, Twitter is not about promoting The Ship, but about connecting with people. Many people I follow aren’t writers at all; of those who are, many are far more successful than I am; many are still working on their first novel, or fighting through the process of seeking an agent, or a publishing deal. Some, of course, are on the verge of publication of their own debuts, and I love getting excited for and alongside them. 1. Engage with social media in a way that’s comfortable for you – but engage with social media. 2. Believe in your publisher’s belief in you. 3. No one knows your book better than you do – but that doesn’t make you a marketing expert. Selling your book is a team effort, now more than ever. 4. Communication is key – keep in regular touch with your editor and publicist and let them know what you’re doing as well as listening to what they are doing on your behalf. 5. Don’t compare yourself to other authors. That way madness lies. If you were at the event; thank you for coming. It would be lovely if you contributed anything you found particularly helpful, and I’d be happy to respond to any questions from an author perspective. Thank you, too, to Anna for her excellent chairing, to Sheila and Marissa, and to Rebecca for bringing us together. shame I missed you at the Fair! I was there on the 15th. Have found you/your blog through the lovely Kerry Fisher who is a writing friend. Helpful blog about Social Media and debut authors.. thanks! Come say hello on Twitter! Really helpful post, Antonia, and I’m so wishing I could have been there. I’ve taken on board your point about blending arrogance and humility – sounds a contradiction but makes perfect sense. It’s a tough one so I’m glad it makes sense. Thank you – I wish you’d been there too, I’d love to meet you in person someday. Inspiring and informative – many thanks for this post, Antonia. I’m glad you were there and grateful for all your feedback and advice. It will be very helpful. I am not a natural with social media, finding it more uplifting and enjoyable to communicate with and support other writers than to promote myself, and yet can see how important it is for a debut novelist to have their own unique presence. Your post is both reassuring and confidence-boosting. Really nice, positive piece on LBF. I’ve been twice, once almost by accident in 2003 and again last year, just for fun. The biggest change was the explosion of digital services and the increasing space given to independent authors by big brands like Kindle. 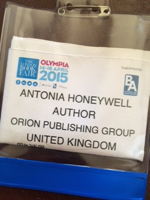 I think the fair is even better for authors than it used to be and is shifting with the times. One particular event I enjoy, and a great place to find new authors was that monthly Speakeasy event at Drink Shop & Do in King’s Cross. The Ship is waiting for me on the shelf! Thank you Paul. Yes, I loved that Drink Shop & Do event – do let me know what you think of The Ship when you read it, and hope to meet you again sometime. Thank you for sharing this with us. Fabulous piece as always. You most positively had every right to be there, Antonia. I hope you’re still grinning. How could I forget? Prizes such as yours are so important and am I right that Hermione Eyre’s Viper Wine is a debut novel? I think the others on the Walter Scott shortlist are by established novelists but stand very ready to be corrected.